Like many other Jane Austen readers, I first came upon Austen after seeing one of the many films adapted from her novels. I was in grade school in the late 1990s when I saw Sense and Sensibility—the film with Emma Thompson, Hugh Grant, and Kate Winslet. I loved everything about the movie too! The cast, the characters, the scenery, and most importantly, the plot. Upon finding out the film was adapted from a novel, I looked for Sense and Sensibility in the school library, finished the book in two days, and the rest, as they say, is history. I’m under the opinion that one simply can’t stop with a single Austen book. Suffice to say, I was hooked. And I’ve been reading and rereading Austen since. Jane Austen was born on 16 December 1775 to a country parson in Steventon, Hampshire. Her father, Reverend George Austen, was by all accounts, a supportive father. After Jane showed interest in literature, he encouraged her to continue reading the works of prominent writers like Sir Walter Scott, George Crabbe, and Henry Fielding. Apart from devouring the works of these literary masters, Jane was also interested in creating her own stories. She started with sketches of popular romance stories, and gradually progressed into her full-length novels. She wrote in secret too—in between her household chores. How she found the time to pen six of the most beautiful novels in Classic literature is beyond me! 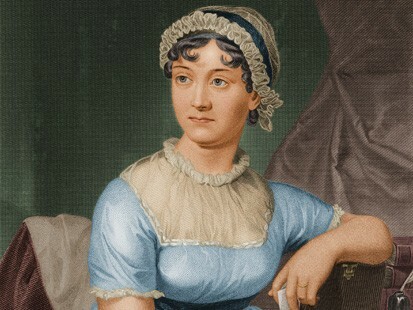 During her lifetime, she saw four of her novels published—Sense and Sensibility (1811), Pride and Prejudice (1813), Mansfield Park (1814), and Emma (1815). Two of her novels, Northanger Abbey (1818), and Persuasion (1818), were published after her death. Austen fell ill sometime around 1816. She attempted to ignore her illness, but her health continued its slow and steady decline, until she succumbed to this illness on 18 July 1817. In the last century, many medical experts have tried to figure out Austen’s mystery illness. Some have suggested Addison’s disease, others, Hodgkins lymphoma or tuberculosis. Others still, believe that it was a type of typhus called Brill-Zinsser disease. Either way, the disease was slow in coming and gave Austen time to continue writing. Time, however, ran out before she could finish Sanditon (1817). Today, Jane Austen is considered one of the most prominent female novelists in history. Her writing is lauded by critics and literary masters like Somerset Maugham and Sir Walter Scott for portraying the‘real’ and ‘commonplace’ in such a remarkable manner, which makes it impossible to dismiss her writings as merely ‘romantic’ in nature. Her exemplary technique of transforming the ordinary into something worth reading shows her mastery over human emotion and the English language. Though her works are often classified as Classic Romance novels, many believe that they are also excellent social commentaries that border on satirical at times. Thanks for dropping by my blog. I have not read much by Austen. But Pride and Prejudice is one of ym favorite novels. Pride and Prejudice is one of Austen’s best works. 🙂 You have a very interesting blog and I really like your taste in literature. Looking forward to reading more posts from you.